Excel 2007 presents a useful tool to build graphs and improve the presentation of information. Lets take a look at the Toolbar to learn how we access the graph making function. The graphics options found under the Insert tab in the toolbar. But, how do we create a graph? 2) We select the type of graphic we want. For this example, we will choose Column. 4) Now, the graphic will be created in our worksheet. The graphic will depict the information we have selected. 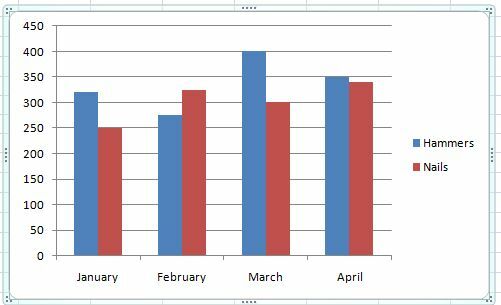 As you can see, this graphic presents the months under the X-axis and the monetary values for sales are presented on the Y-axis. The columns represent the two products of interest. We have just created a simple graph. However, we can improve its presentation by adding a title and names to each axis. Lets write the title for the graph. How do we do this? a) In the graphic tool bar, we look for the section corresponding to Labels. b) We click on Graphic Title. c) In the graphic in our worksheet, we will see a rectangle with the words Graphic Title. This is where we write our title. d) We write the graphic title. For this example, we have used "Sales"